It’s a beautiful Saturday morning and I’m sitting at the glass dining table in our kitchen cove. All three windows here are open and the curtains are dancing on the warm summer breeze. The windows look out over the park and there is classical music playing as they do sound check from what looks like some kind of festival setting up there. It is amazing that I am sitting in the comforts of my own home and yet still feel such a part of the city. 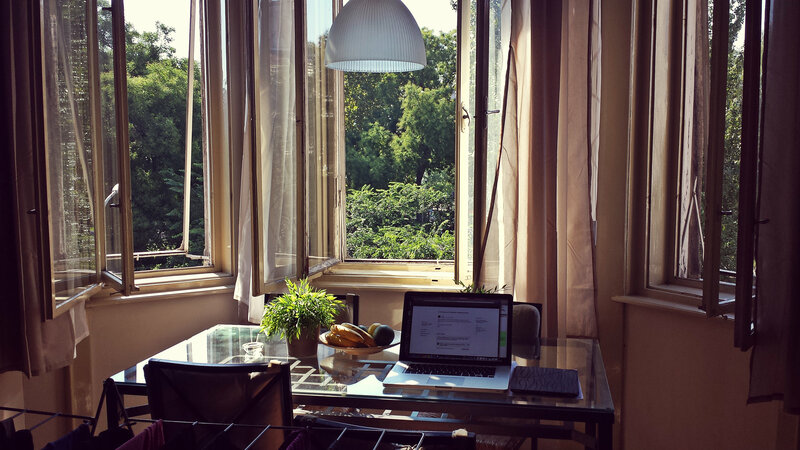 This is, without a doubt, the best apartment we’ve lived in – both in Norway and Budapest. Our apartment was furnished when we got it, but it was missing some bigger pieces. It was worth it to us to put in a little bit of money into making this place feel like home. We got bookcases, rugs, curtains, decorations – you name it! 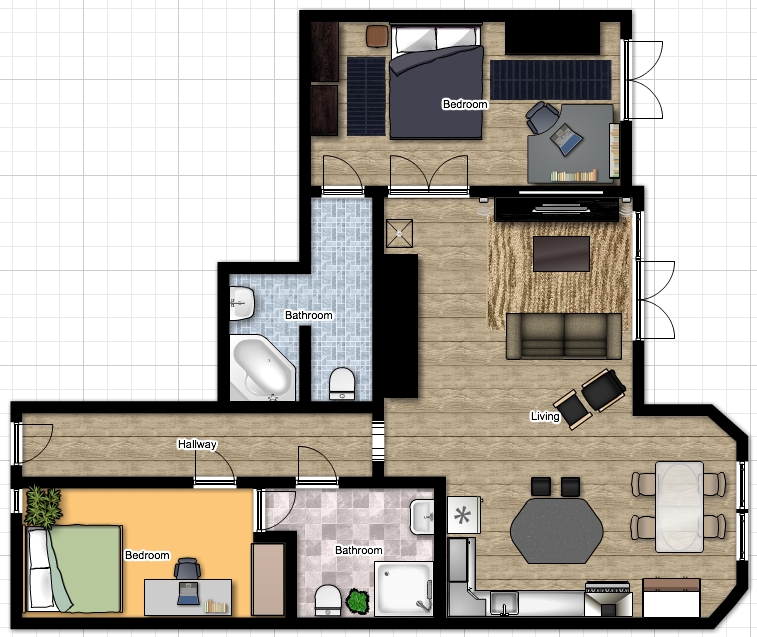 Before our first trip, I used an online floor planner program to make a virtual version of our apartment. I was up early so I had some extra time and I thought it would help us to visualize which furniture to get. Here is a link to the design, where you can look in closer detail and move the apartment around to see it from different angles, in 2D and 3D. The virtual apartment really helped us decide which pieces to get. Whenever we go to IKEA, we always spend way too much time thinking about whether or not something will fit and if it will look good or if we should go for something else. I wanted to make it as easy as possible this time around. My plan didn’t work so well, however. Our first trip to IKEA lasted for 6 hours – it was hell! Here’s an idea of the madness we were facing at home. It was so overwhelming! And now, here is the finished project. Some of the photos were taken at night and are a bit dark, so I will swap them out when I get the chance. One of two standing room balconies. The second is off our bedroom. Guest room/study area. I call this the hodge-podge room because we used all the furniture that was left in the apartment. We bought the bed, but other than that, all the other furniture came with the apartment. You really made it feel so comfy plus it has a very artsy/modern feel to it. That’s a really neat job you did there B! What a nice view from the desk! Will you eat or also study there? The pillar in the bathroom adds a lot of character. Is that your guitar in the corner of the living room? That bathroom was SO hard to decorate. I like the pillar now…but I wasn’t so sure about it then. Such a strange bathroom shape! I have been following your blog religiously for almost a year now and I finally got into Semmelweis!In anticipation of moving, I have been looking at apartments. I love your apartment and I was wondering if you found it through a particular site or company. Any advice on apartment hunting would be appreciated since it’s unnerving to do this in another continent Thank you!! We rent from a company called VIP Properties and we are really happy with them. We rented from them at our last apartment as well. My biggest most important piece of advice is to see the place in person before you agree to rent it. It is very often that the place looks nothing like it does in the pictures and you should get a feel for the area before you sign a contract. Like any city, there are a lot of safe areas and also others that are not so safe. I really recommend finding a place near either Octogon, Kalvin tér, or Deak tér. Those are all really nice areas, easy to get to, and are quite student friendly. There are also a lot of students that live in the complex located at Corvin-Negyed. There is a nice mall there and the remodeled area is really nice. Stick to the 5th, 6th and 7th districts. School is in the 8th district and I would definitely warn against living there. Even teachers warn against living there! It is definitely possible to find places to live on your own, but it might be nicer to live with someone. Someone usually sets up a facebook group for future freshman students, which makes it easy to find someone to live with.As for the area, it took us some time to get a feeling for how it fit our lives. I think the most important thing is to live near the metro, either near the Deák station (where all the metro lines pass through) or off the blue line somewhere (since the blue line goes there). If you find a place near Corvin, school is only a 10 minute walk away. If you live near Kalvin, you have quick access to the giant central market and are close to both the 24-hour library and the beautiful Corvinus library. Thank you so much! It truly does help and I really appreciate it. You are currently reading Home Sweet Home at Buda-B.